Noodles are a quintessential part of any Filipino gathering! Join me as I celebrate my blog’s 9th blog birthday with this easy recipe for Pancit Canton. It may be party ready, but it’s simple enough for a weeknight meal. On January 31, 2010, this blog was born. I had named it Kitchen Worthy, with the hopes of sharing anything that was worthy of being in the kitchen, and a few months into my blogging adventure, I had to rename my blog-baby. I’m not sure if you’ve been reading long enough to remember this…chances are you found me further along in the process…but if you’re curious about how and why I had to rename the blog, I tell the story on this podcast. If you do remember, wow, we’ve been together a long time. Nine years to today, in fact. In these nine years, my goal is still to share with you anything worthy of being in the kitchen, whether it’s a recipe or a wine or a handy tip to make life easier, and I hope you’ve found a few things to make your life more delicious. I just want to take a minute to thank you for joining me on this journey. A lot can happen in nine years, and a lot certainly has! I’ve made wonderful friendships, traveled to amazing places, sipped lots of wine, met so many farmers, and cooked countless recipes. Many of my own family favorites have become yours, too. I love when I hear that my mechado reminds me of the meat and potatoes dish your grandmother made, or that my father-in-law’s buttermilk banana bread has become your go-to recipe, too. So when I celebrate nine years of writing Kitchen Confidante, I celebrate nine years of friendship with you. It is you I think of when I cook in my kitchen — I imagine you sitting in the chair at the kitchen island with me, chatting about what happened today, and sharing good food together. Without you, this blog would not be. This calls for a celebration! A birthday is not complete without noodles in my family — I love this Filipino tradition of having pancit for long life! 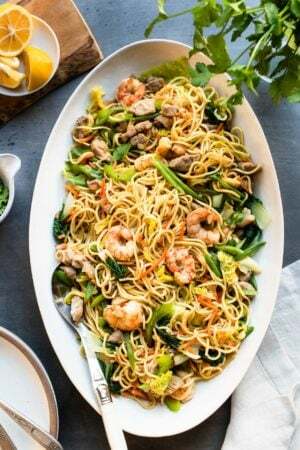 By now you know that Pancit Bihon is usually what I make for special occasions, but Pancit Canton is another party-staple of any Filipino fiesta. Between you and me, I think of Pancit Canton as perfect for a weeknight meal – it’s actually quite easy to make, and perfect for cleaning out your vegetable drawer — you can customize it however you like! Commonly made with chicken, pork and shrimp, you can easily make it pescatarian- or vegetarian-friendly, too. So go grab a fork, and let’s dig into some noodles, shall we? 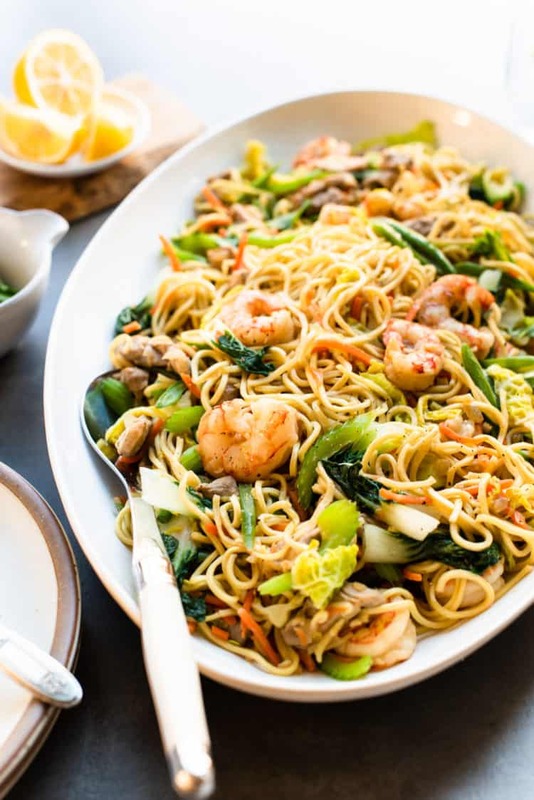 There are many popular noodle dishes in the Philippines, and Pancit Canton is a common stir-fry noodle that is most reminiscent of Chinese influence to Filipino-cuisine. Made with wheat flour noodles, Pancit Canton is often described as Filpino chow mein (more on that below), and the flavors are quite similar with its use of soy and broth to flavor the noodles and vegetables. Pancit Canton is often made with pork, chicken, and shrimp, and a variety of vegetables, and depending on who makes it, it may also include chicken liver and Chinese sausage (which I have omitted here). Is Pancit Canton the same as Chow Mein or Lo Mein? Pancit Canton is often described as a cousin to Chow Mein and Lo Mein, which is a stir-fry noodle dish that many of us who love Chinese food grew up eating. They are definitely quite similar, however, there are a few main differences. One is in the noodle itself. 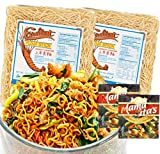 Chow mein noodles are egg noodles, whereas Pancit Canton noodles are wheat flour noodles, though depending on the brand of pancit canton noodles you purchase, some contain egg powder. 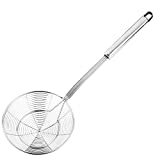 I prefer the plain wheat flour noodles for its bite and texture. The other main difference is in the preparation. When making Pancit Canton, the dry noodles are added to the broth towards the end of the dish, and no pre-boiling is necessary. With chow mein and lo mein, the noodles are boiled (or fried) and drained first (like making spaghetti), then added to the stir-fry after. Where Do I Buy Pancit Canton Noodles? If you have an Asian market such as 99 Ranch near you, you can easily find Pancit Canton Noodles in the noodle aisle. It will be labeled as “pancit canton noodles: flour noodles.” You can also find Pancit Canton Noodles on Amazon. See the recipe below for substitution recommendations. Disclosure: There are affiliate links in the post, see my Disclosure page to learn more. Pancit Canton is a party staple in the Philippines! 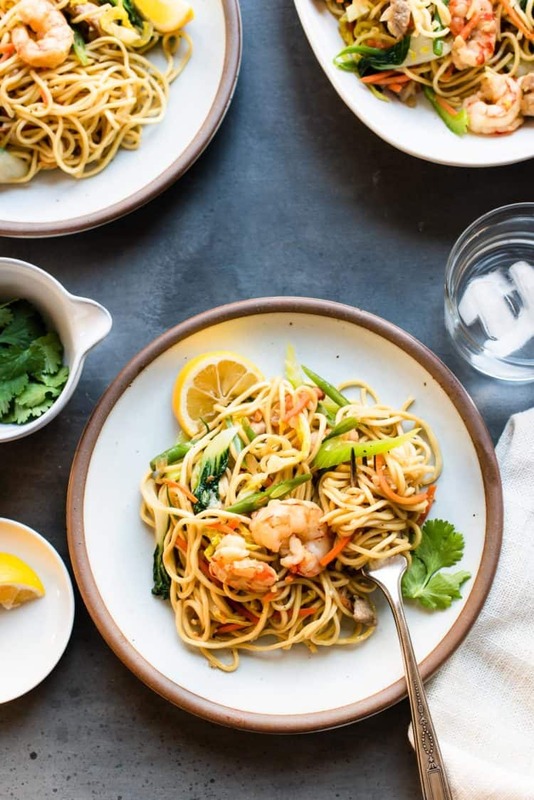 These Filipino Stir-Fried Noodles are a close cousin to chow mein, and while it's fiesta ready, it's easy enough to make for a delicious weeknight dinner. Bring 5 cups of water in a pot to boil. As the water heats up, prepare an ice bath in a large bowl and a paper towel lined plate and set aside. 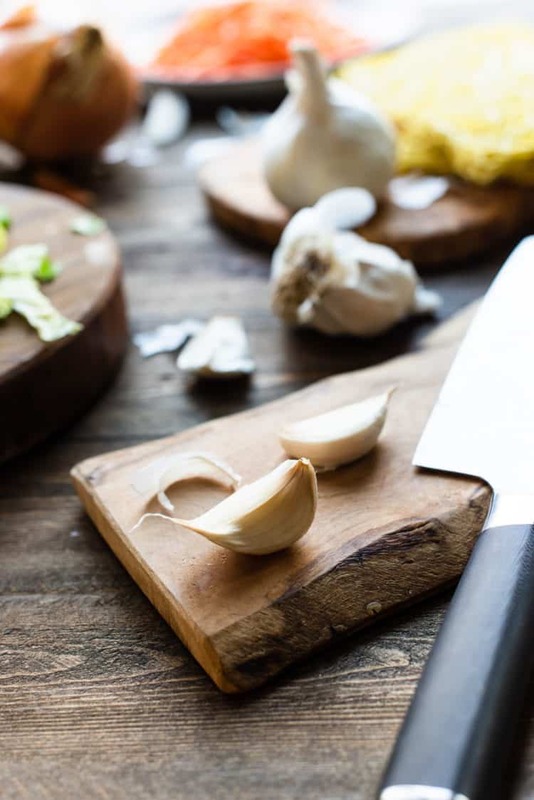 Once the water comes to a boil, salt the water with about a tablespoon of salt and drop in the vegetables, blanching for about 1 minute. 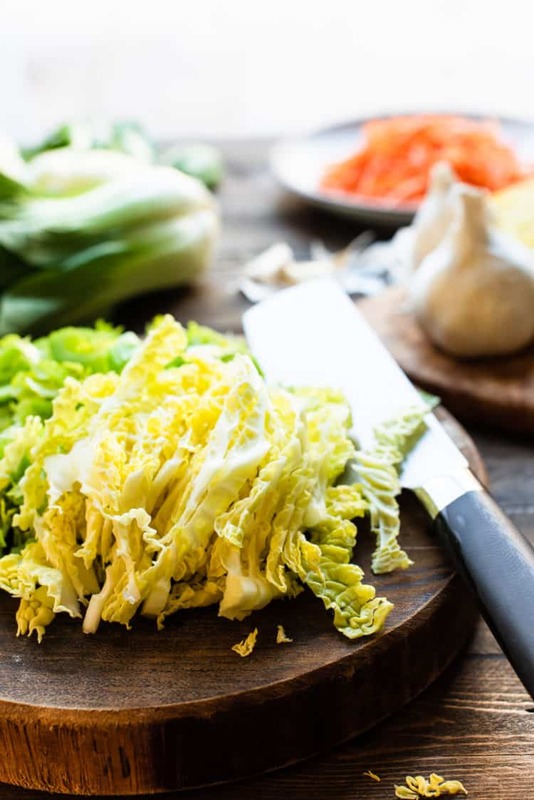 Use a slotted spoon to transfer the vegetables into the ice bath and let it sit for 2 minutes. When the vegetables are cool, drain the vegetables, place on the lined plate, and set aside. Heat the olive oil in a wok over medium-low heat. When the oil is hot, add the onion and garlic, and cook for about 3 minutes, or until the onion is translucent. Add the shrimp to the pan and let it cook for about a minute or until it just turns pink and it curls up. Using a slotted spoon, remove from the wok and set aside. Add the pork, season lightly with salt and pepper, and cook for about 2 minutes, stirring periodically. Stir in the chicken broth, water, soy sauce and Worcestershire sauce and bring to a boil. Let it simmer for about 5 minutes. Add the noodles into the wok, tossing the noodles as it absorbs the sauce. If you find that the noodles are too dry, add a little water if necessary. 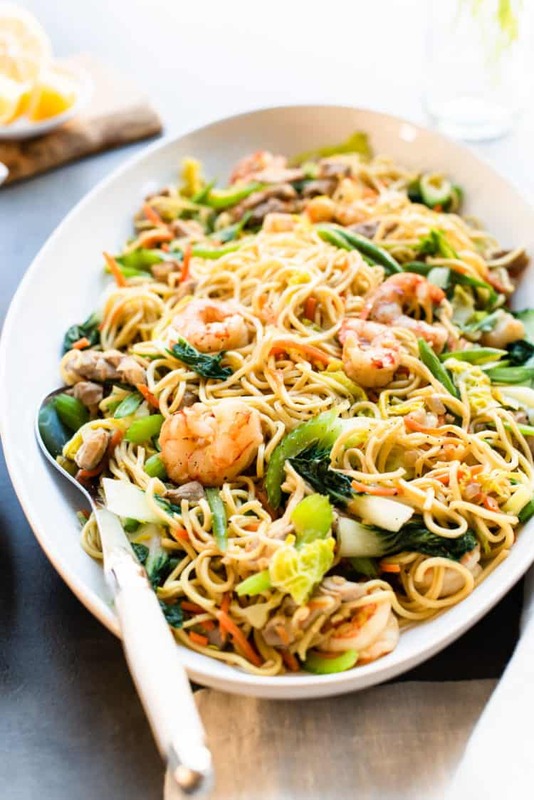 When the noodles are soft, stir in the reserved vegetables and shrimp, tossing to combine. Cook for about another minute more. Transfer the pancit to a serving dish, garnish with cilantro. Serve immediately, with a squeeze of lemon juice to taste. This is the Pancit Canton recipe I learned years ago from my Tita Tess when she cooked it for our Christmas family parties. Her version is more of a one-pot meal in that she begins the recipe at Step 2 and drops in the vegetables at the same time as the noodles in Step 5. I have since adopted the method of blanching the vegetables from Panlasang Pinoy, and like the crisp texture of the vegetables when adding this step, however, if you're short on time or don't feel like washing extra dishes, you can certainly do it Tita Tess' way! The type of noodles you use really makes a difference. If you can't locate Pancit Canton noodles at your Asian Market (I like the Excellent brand, also available on Amazon), you can substitute spaghetti noodles. 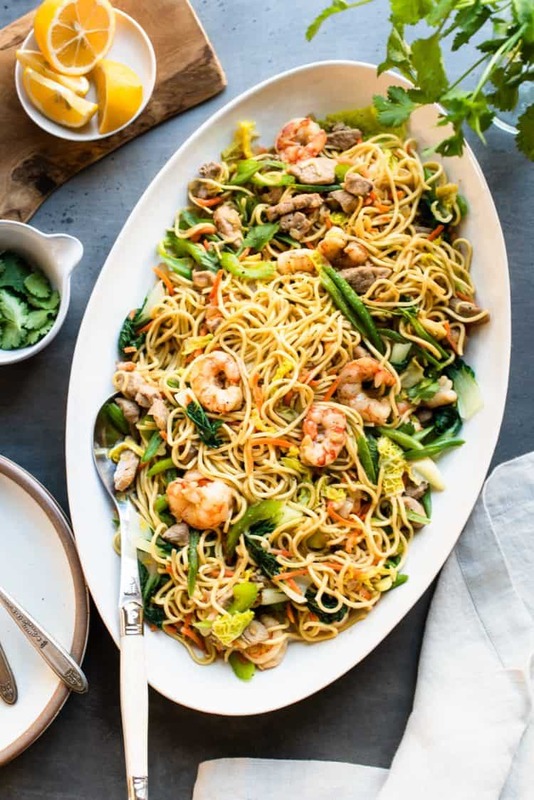 Lo mein or chow mein noodles can also be used, but do be careful and take time to pre-boil and drain the noodles first; some chow mein noodles have a tendency to get gummy and sticky, which is quite unpleasant in this dish! Pancit Canton can easily be translated as a vegetarian noodle dish. Omit the meat and substitute chicken broth for water or vegetable broth. 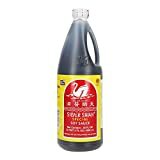 Do you think I could substitute bihon noodle? It’s what I have, plus I like the ingredients that you use.